We have been running a little experiment at home and with children in my research projects this past year. It’s a buffet-effect type of study…the idea that you eat more when a variety of foods are present. My first experience with childhood obesity was my junior year as an undergraduate at the University of Buffalo. I was working in Leonard Epstein’s lab and was learning all about a concept called sensory-specific satiety. Barbara Rolls from Penn State University popularized this idea in the 80s. Simply put, if you eat a large amount of the same food (like a bowl of spaghetti), your taste buds sort of get bored after a while and slow down. At a buffet, however, new flavors/taste from different foods “reset” your taste buds in a way that promotes more and more eating by stimulating your appetite. This is kinda scary, but we’ve been putting a healthier spin on it. When my son’s picky eating peaked just after his first birthday, we started presenting him with multiple foods in an ice cube tray, a tip I found on Dr. Sear’s website. I think the novelty of seeing different kinds of foods piqued his interest, and increased his intake to some degree. He is much less picky about eating now, but we know that this may be a useful way of increasing children’s intake of healthy foods. We are still collecting data from children in the “real world” using this technique to increase fruit and vegetable intake, so we don’t yet know if this is truly effective (in a way that we scientists would consider effective). We do know that kids who refused to try common foods like papaya or cucumber at our first session were trying them by the second session. This could also simply be a result of experience and exposure. 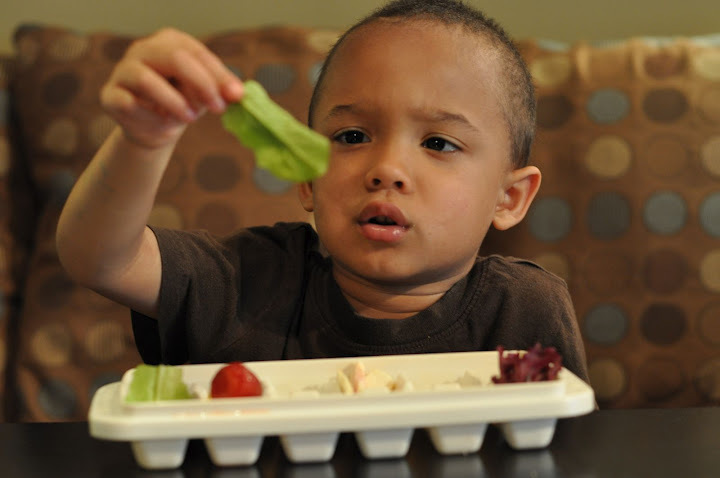 Studies published by Leann Birch and her colleagues (reviewed here) show that some children need to be exposed to new foods multiple times before they choose to eat/try it. 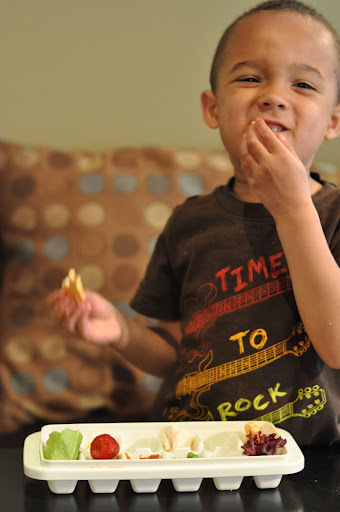 Either way, multiple exposures, and lots of variety can help picky eaters eat more food, especially the kinds of foods they should eat more of. We’ll keep you posted on our findings as we go along!